This area of the CanIt user interface allows you to customize the appearance of the web interface, save and restore your custom Rules, adjust your SPAM tolerances in detail, and set notification times. The settings in the Preferences section of this page are self explanatory and can be adjusted to suite your needs. Click on the ‘Preferences’ tab to alter the look and feel of the web interface. Click on the button after making any changes on the menu. For example, selecting ‘Checkbox’ for the Method for choosing spam-quarantine actions perference makes dealing with your SPAM Trap more stream-lined and often quicker. If you have entered any custom Rules, the ‘Export Rules’ and ‘Import Rules’ tabs allow you to save and restore your custom settings. Valid E-mail, which is delivered. The values on the Stream Settings page allow you to adjust the SPAM score values for messages to be Trapped by the system (category 3 messages). Messages scoring above the Automatically reject messages scoring more than this amountvalue will be automatically rejected as SPAM and moved to your SPAM Trap. Messages scoring below the Spam threshold value will be automatically sent to your INBOX. Messages that score in between these two values will be held in your SPAM Trap as Pending messages. Pending messages are those that you have to determine whether they are SPAM or valid E-mail. 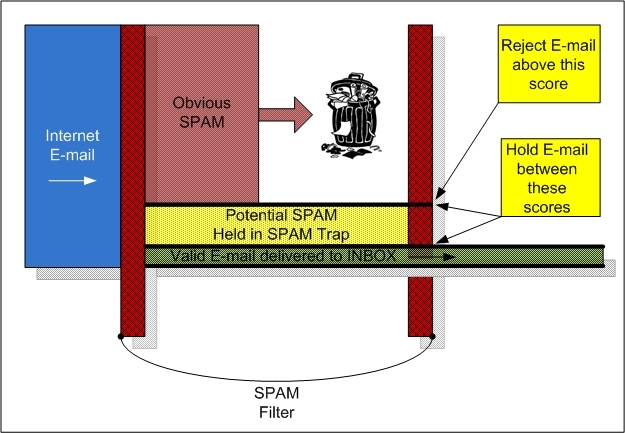 Allows you to tailor how often you are notified about e-mail in your SPAM quarantine. The default is once-per-day at 3:00PM. The Sub-Tab ‘Set Default Stream’ is not applicable in the current configuration and should not require any changes.